Harling founded the firm in 1851 at 47 Finsbury Pavement, London. They specialised in making drawing instruments, with a factory at Grosvenor Works, Hackney, London EC. According to Scott-Scott they ceased making instruments to the traditional pattern in 1929 and changed to flat pattern ones. In 1964, having merged with Blundell Rules Ltd in 1961 to form Blundell Harling, they moved to Weymouth. A traditional pattern set dating from about 1900 in a Morocco leather covered case. 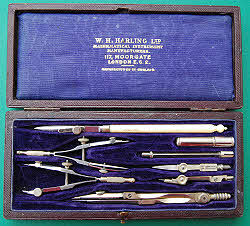 A Harling "Woolwich" case of electrum instruments (missing large compass, dividers & pencil bow). 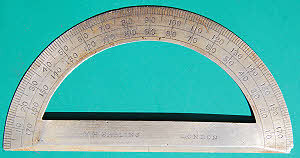 Under the large protractor there is a pair of vulcanite set squares and in the bottom compartment there are a set of marquois scales and a number of scale rules, all signed Harling. 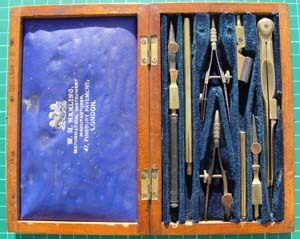 A top quality set of small size drawing instruments in a Russian leather pocket case (rather distressed). 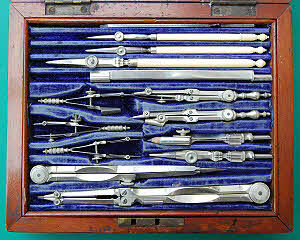 The needle points are all of the screw off type more usually associated with instruments by A G Thornton and J Halden. 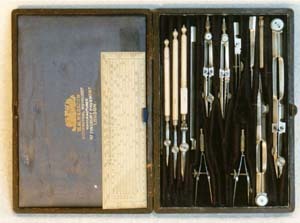 The set comprises a 4 1/2” compass with pen, pencil and needle inserts and two extension bars, hair dividers, pen and pencil bows, three spring bows, two ruling pens and a pricker, a knife key and two other compass keys, and two ivory containers with screw off tops, one for needles and the other for leads. 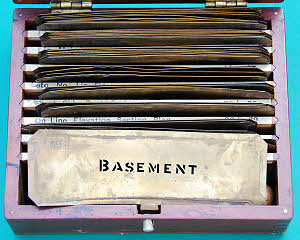 Under the flap in the lid is a 5” ivory protractor signed J Casartelli, Manchester. Originally the property of an architect. 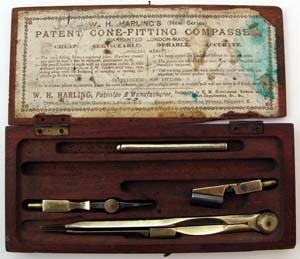 Harling Patent Cone-Fitting Compass in mahogany case with simple machined pockets for the instruments. The label has the addresses: Office: 40 Hatton Garden, London EC and Factory: Grosvenor Works, Hackney E on it dating the set to pre-1888. The label also lists the “Special Merits” of the set and “Instructions for Fitting”. They were “Warranted London-Made”. 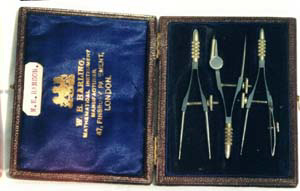 A later cone-fitting set. The compass and other parts from the set above have been used to complete this one. This was a later set. The address on the blue oil-cloth lining to the lid is 47 Finsbury Pavement. Probably early 20th century as the box is comb-jointed. These sets were indeed a very serviceable alternative to the cheap foreign sets then flooding the student and school market. The long joint head of the compass is well made with two steels but the other hinged joints are much cruder being just brass. Early twentieth century set by W H Harling, Finsbury Pavement, London. 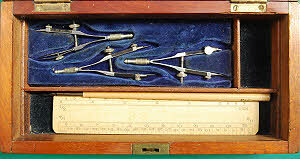 Unusually this set has a set of Swiss pattern beam compass fittings instead of a compass half set. The instruments are electrum and of the highest quality. 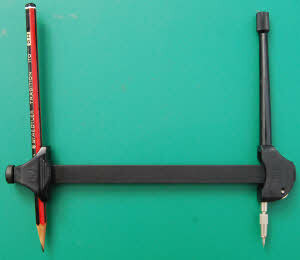 The upper ruling pen is a litho pen by Lotter, and not by Harling. The case is morocco covered and lined with blue silk and velvet. 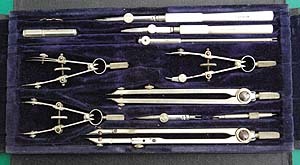 Bow compass set, number 775 in the 1930 catalogue. 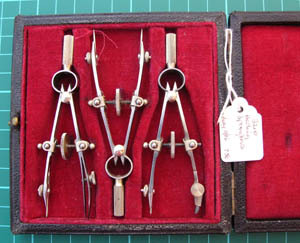 A cased set of three spring bows by W H Harling which date from the early twentieth century. Having plain steel points they are not of the highest quality. Spring bows were used for drawing small circles and for marking off or measuring small distances on a drawing. A government flat pattern set dating from 1953, code W10/VC/5841. I also have a smaller, incomplete set of similar instruments, code HO758 (Royal Navy hydrographic office). British Empire series BE112A set dating from ca.1936. The instruments are electrum and stainless steel and the pens have ivory handles. The wallet case is covered in black leathercloth and lined with blue velvet. This fine set is in as new condition. 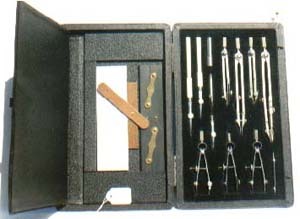 Besides the usual compass, dividers, bow compasses, spring bows and ruling pens this set contains a pricker and a set of roller beam compass fittings. British Empire series set BE106A. 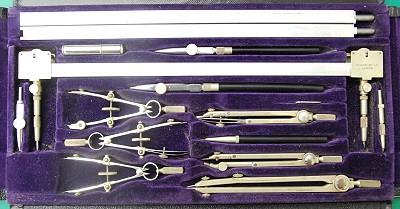 The series was introduced in the early 1920s, but this set is probably post WW2 as the pen handles are ivorine rather than ivory. The wallet case is covered in black leathercloth and lined with blue velvet. The instruments are electrum and steel. This flat pattern “Technical Series” student's set in a wallet case probably dates from the 1930s. 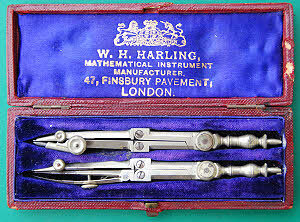 This Harling, London set contains two ‘Centex’ beam compasses. The larger one has three triangular section, tubular, aluminium beams and ink, pencil lead and needle points. It extends to 28 inches. The smaller one has a 5½ inch beam and again has ink, pencil lead and needle points. It was intended to take the place of the normal type of compass. The legs of the spring bows have a black finish. The zip fastening case is leather and lined with black silk and velvet. Ca. 1960. A bright nickel plated brass & stainless steel flat pattern set said to date from 1971. This would have been the original owner’s purchase date - it was almost certainly made in the 1960s, probably after the move to Weymouth, although the case is labelled “Harling, London”. A set of roller type beam compass fittings, probably dating from the 1950s. These were supplied to fit a wooden lath, which was available in a range of lengths. A fine, fifteen inch, boxwood & lacquered brass, parallel rule for navigational use by W H Harling, 117 Moorgate, London. The makers were at this address in the 1930s. It has a fine, fitted mahogany box. 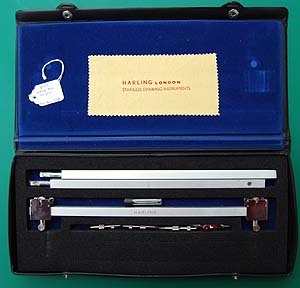 A set of Harling spring bows with Harling’s patented central screw adjustment. These were catalogued from 1930 until the 1950s at least. Patent no 35186/20. Harling detail pen and Harling road pen. The latter is Harling’s offset pattern to allow a better view of both nibs. 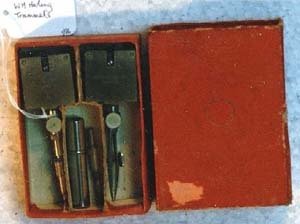 A three tier case believed to be by Harling (the three pens are signed Harling). The mahogany case is brass bound. The upper tray contains the usual full set of electrum instruments whilst the middle tray has eleven cakes of water colour by Reeves & Sons embossed on the reverse with the broad arrow and Council of India. The Council of India was the governing body from 1773 to 1920. 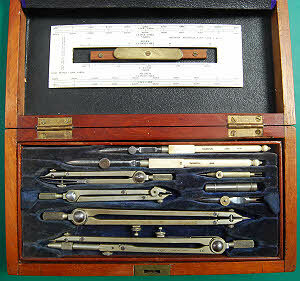 The case bottom has the usual compartments for a protractor and parallel rule but these are empty. Probably ca. 1870. 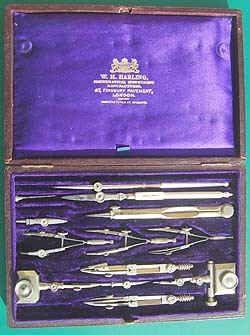 A Harling set made for the UK government in 1937. 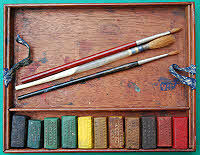 The instruments in the tray are British Empire pattern but the pens are by Thornton and dated 1935 and 1936. The boxwood scale rule is a later addition. 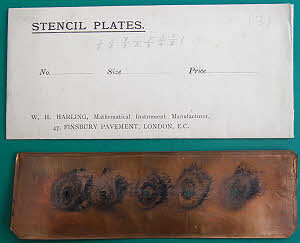 A set of three brass stencil plates for numbers and fractions in the original W H Harling paper envelope. Probably early 20th century. 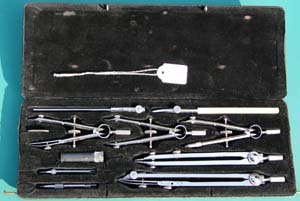 Harling 4.25 inch semi-circular electrum protractor, probably from a case of drawing instruments. Plan, Second Floor, First Floor, Ground, Basement, Scale Feet to an Inch, and lastly a north point. There is also a stipple brush. The set is complete. The Blundell Harling Arcliner described as “The Drawing System for the Eighties” in their 1980 catalogue. A revolutionary alternative to the conventional drawing compass, the 15mm diameter socket could accommodate technical pens and clutch pencils as well as ordinary pencils and could draw circles up to 150mm radius. There was also a beam compass version for circles up to 1m radius. Mostly made of plastic it came in a vacuum formed PVC case. 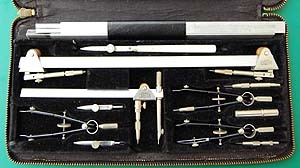 Sharp’s Universal Drawing Scale Copyright Rd. No. 196267 (1892). A 12” double sided boxwood scale made by W H Harling, 47 Finsbury Pavement, London. The upper face has the following scales from top to bottom: 1/8, 1/4, 1 1/2, 3 IN, 1/2 SIZE, FULL SIZE, 1 IN, 1/2 IN. The lower face has cm and inch (x 1/50) scales. 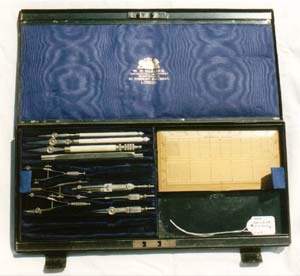 A set of ink and pencil lead bow compasses in a Morocco case, probably dating from the late nineteenth century. They are double jointed with plain needle points and made of electrum. 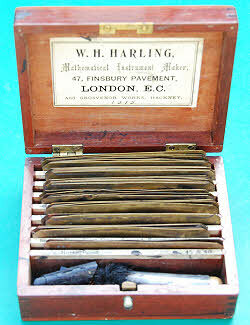 Harling BE114A British Empire pattern drawing set in a black leatherette covered wallet case dating from the 1950s. 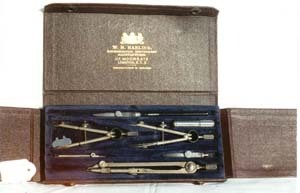 This set did not have a 6” compass as the beam compass could be used for the same purpose. 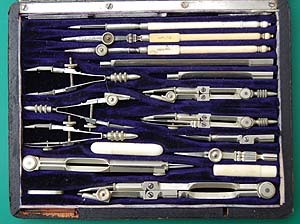 The pens and pricker have Erinoid handles and the larger pen is Harling’s Quick Set type.